Please join Boston Harbor Now at the 9th annual Spectacle Island 5K for beginner and elite runners alike and all those who want to have fun on Boston Harbor! Enjoy panoramic views of Boston Harbor and the city skyline from this historic island. Race day festivities feature a 5K Race, a half-mile Kids Fun Run, picnic lunch for participants, music, a beer ticket, and kids’ activities. All proceeds from the Spectacle Island 5k will help support free and equitable access to Boston Harbor and Islands, and help improve lives of 40,000 youth and their families. The race will start and finish on Spectacle Island in Boston Harbor. Ferries will depart from Long Wharf North and the Hingham Shipyard. Click here for more information on getting to the ferry departure point at Long Wharf North. This is a rain or shine event. However, park officials, ferry transportation providers and race management have the authority to cancel the event for emergency purposes such as, but not limited to, severe inclement weather to ensure public safety. If such emergency conditions force cancellation, the event entry fee is non-refundable and non-transferable, as funds will have been spent in preparation for the event. However, registrants would be sent a complimentary ferry ticket to travel to the Boston Harbor Islands on their own at a future date; t-shirts would be mailed to applicable event participants; and spectator ferry tickets would be refunded. For more information contact race director John Childs at 781-325-6634. The 5k Race will begin at 10:00 am. Race Day Registration and Packet Pickup will begin at 8:30 am on Spectacle Island. Event day registration for all events will be available beginning at 8:30 am on race day. The relatively flat course on crushed stone path goes twice around around the perimeter of Spectacle Island. Volunteers call out mile splits. There are two water stations on the course. Awards will be presented to the overall top 3 male and female winners as well as first place male and female finishers in the following divisions: Age 12 & under – 13-19 years old – 20-29 – 30-39 – 40-49 – 50-59 – 60-69 – and 70-plus. Limited bag check will be provided to 5K participants. For the safety of participants and in adherence to USATF insurance guidelines, strollers, bicycles, inline skates, skateboards and dogs are not permitted. The course is USATF sanction and certified. Half-mile fun run for children under 12 from the Visitor’s Center to the island’s saddle and back. Registration is required. Please note that children under 12 will need adult supervision if the parents/guardians are running the 5K Race as we do not have staff assigned to supervise the children. For the safety of participants and in adherence to USATF insurance guidelines, strollers, bicycles, inline skates, skateboards and dogs are not permitted. Skip the lines on race day and earn a chance to win great prizes when you pick up your packet early! Location and times TBD. Packets can also be picked up race day morning upon arrival at Spectacle Island. We recommend taking public transportation to the ferry dock at Long Wharf. Parking is available in area lots near Long Wharf North, as well as at Hingham Shipyard. Spirit Award: prizes for the runner with the best Boston Harbor-inspired attire! We couldn’t do it without our dedicated team of volunteers! 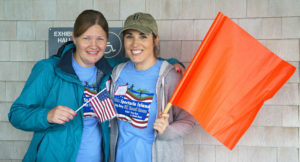 Volunteers receive free round trip ferry passage to Spectacle Island plus lunch, a volunteer T shirt, and the chance to be part of a fun and rewarding day on the harbor.